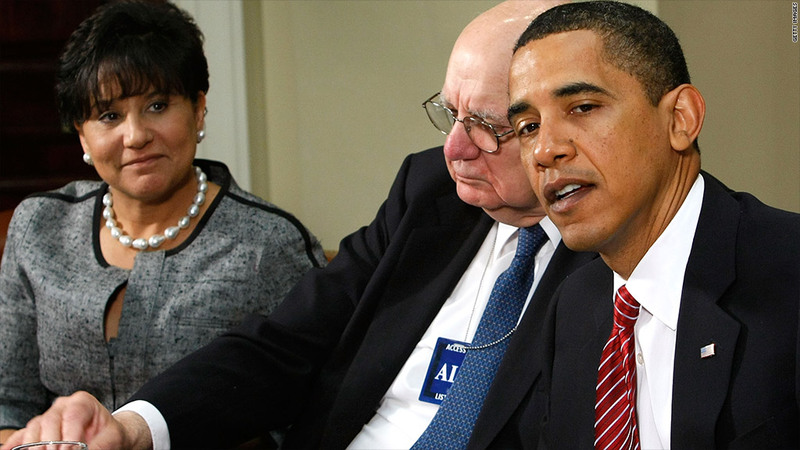 Penny Pritzker (left) is expected to be nominated as commerce secretary by President Obama. President Obama's allies in the labor movement may not be happy with his choice for commerce secretary. Obama nominated Chicago businesswoman Penny Pritzker for the post at a ceremony in the White House Rose Garden on Thursday. Pritzker still needs to be confirmed by the Senate. Pritzker, one of the wealthiest women in America, is an heiress to the Hyatt (H) hotel fortune who heads the investment firm PSP Capital Partners and an associated property firm, Pritzker Realty Group. Forbes Magazine pegged her net worth at $1.85 billion as of March. The nomination is a bit of payback for Obama -- Pritzker is a longtime donor who served as national finance chair of his 2008 campaign and national co-chair of the 2012 campaign. Along with the donations she solicited from other elite contributors as a "bundler," Pritzker personally gave the Obama campaign and the Democratic National Committee $63,500 in 2008 and $117,400 in 2012, according to the Center for Responsive Politics. But some on the left are unlikely to welcome her nomination. UNITE HERE, a union representing workers in hotels, casinos and other industries, calls Hyatt "the worst hotel employer in America." "Hyatt has abused workers, replacing career housekeepers with minimum wage temporary workers and imposing dangerous workloads on those who remain," the union says on the website for its "Hyatt Hurts" boycott campaign. In 2009, the company sparked a controversy when managers at three Hyatt-controlled hotels in Massachusetts fired their housekeeping staffs and replaced them with cheap subcontracted laborers. Earlier this year, the Hyatt Regency Baltimore reached a settlement with workers who alleged they were fired in connection with their unionizing efforts. Hyatt says the workers were dismissed for "workplace policy violations." Pritzker serves on Hyatt's board, but is not an executive at the company. Nevertheless, she and her family have been criticized by union activists. Hyatt spokeswoman Katie Rackoff accused UNITE HERE of "target[ing] Hyatt board members and spread[ing] misinformation about our associates' workplace experience" to gain publicity for its efforts. "Hyatt has always been a great employer in the hospitality sector with competitive wages and benefits," Rackoff said in an email. Pritzker, she added, "has a long and distinguished career in business and public service, and Hyatt has benefited from her insights and contributions as a board member." A spokeswoman for Pritzker said in an email that she "has encouraged Hyatt management to negotiate and compromise with its unions and has made clear that she believes the company should maintain the highest standards of safety [at] its properties." UNITE HERE called Thursday for Hyatt to replace Pritzker on its board with a worker representative should she become commerce secretary. Officials at the AFL-CIO and the Service Employees International Union did not immediately respond to requests for comment. Pritzker also drew ire from union leaders during the Chicago teachers' strike last year as a Board of Education member who had pushed school reform efforts. The Chicago Teachers Union accused her of working to "close schools, destabilize neighborhoods and disrupt the economic lives of thousands of public school employees." "We cannot imagine that someone who has a long history of bludgeoning Chicago's working families and destroying public schools would be given a platform to continue these sorts of business practices on a national level," CTU president Karen Lewis said in March following Pritzker's resignation from the Board of Education. A petition on the progressive website CREDO Action, launched amid rumors of Pritzker's nomination, calls her "an anti-worker business mogul who should not be appointed to head the Commerce Department." Pritzker's spokeswoman, Susan Anderson, said she "has worked hard to improve public education and support Chicago's youth for more than a decade," spearheading numerous charitable initiatives in the area. "Ms. Pritzker has supported [Chicago Mayor Rahm] Emanuel's initiatives for education reform and supports the President's," Anderson said. In addition to her campaign work, Obama is already familiar with Pritzker from her advisory roles on his Council for Jobs and Competitiveness and Economic Recovery Advisory Board. If confirmed, she would take over from Rebecca Blank, the deputy secretary of commerce who has served as acting head of the department since June 2012, when Secretary John Bryson stepped down for medical reasons. Like Pritzker, Bryson has a substantial business background, having headed an energy utility for almost 20 years and serving as a senior adviser at the private equity firm Kohlberg Kravis Roberts & Co (KKR). His 2011 nomination drew criticism from some conservatives who cited his background as co-founder of the Natural Resources Defense Council, an environmental group.